Way Hay!!!! my hexagon blanket is finally finished! After a Saturday evening crochet fury session my poor fingers felt like they were about to drop off, in fact by Sunday morning I wondered if they would ever bend straight again! So I added a double border of blue and violet and it just made it into a work of art. It actually looks like it was meant to. 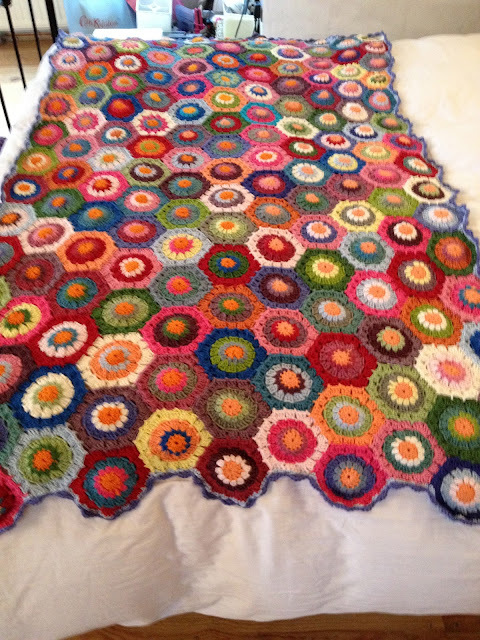 165 beautiful, colourful little cotton hexagons. 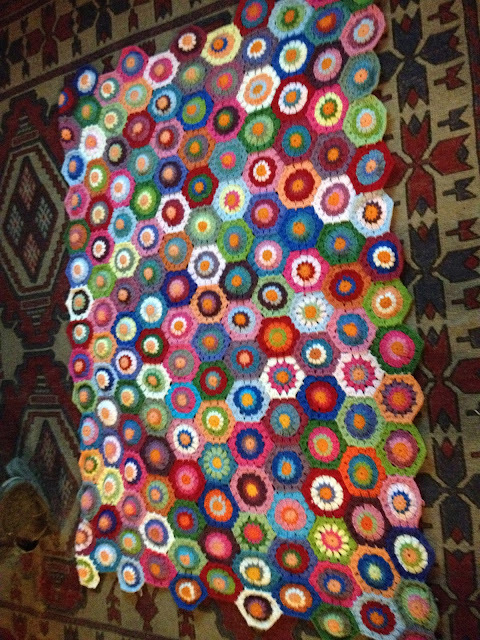 It isn't as big as I had first intended but it is so labour intensive that my mind started to wander to my next project. 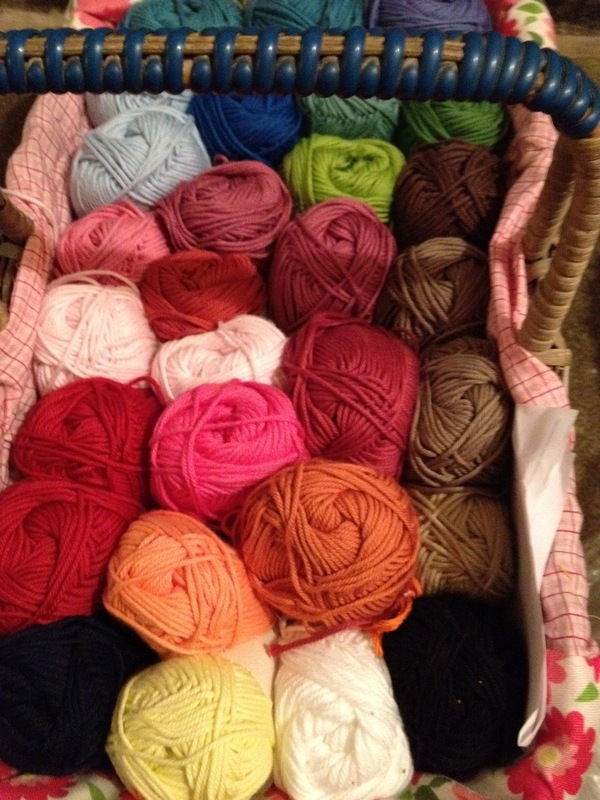 I snipped away all the little ends of woven in thread and this is the result. 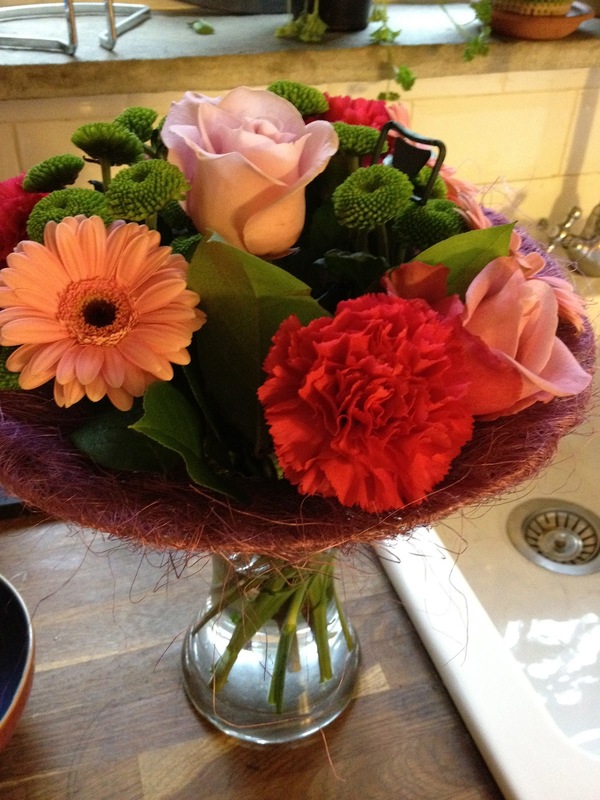 So it was ceremoniously carried upstairs and placed in onto the foot of my bed and WOW it looked breathtakingly stunning, intact my husband commented that he thought I might faint from hyper ventilating at its beauty. It lit up my unfinished bedroom and added a happy feeling to the room, a feeling that my youngest son also felt as when I had the entire family on parade in the bedroom to ohhhh and arhhhh at the wonder before them, Caleb said he liked it so much please could be have it in his bedroom. So reluctantly I said that we could give it a try. I was actually quite surprised that he had taken to it so much because it does have quite a lot of pink tones in it and he is usually adamant that nothing with the slightest hint of girlyness will enter his bedroom. We put it onto his little cast iron bed and it just looked as though it had been made for it and to see the look of delight on his face and when he threw his arms around me saying that I was the best mummy in the world a lump hit my throat and it was his. It looked splendid and enhanced by the ripple cushion I had made a few weeks before and the little banner with his name on his room looks a haven of homely snuggleness, the room of a boy who is loved and adored. 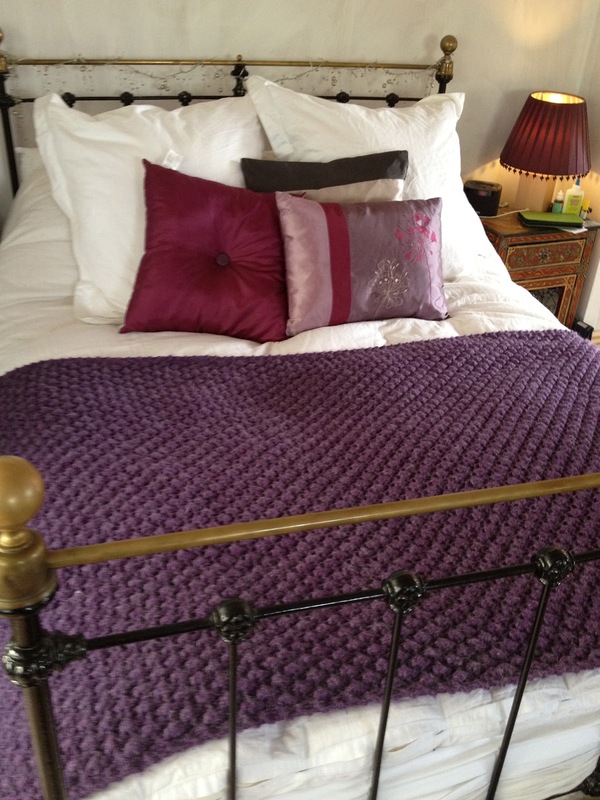 My bedroom returned to is former hand knitted blanket which I just love! There is a sense of comfort from this blanket as it weighs heavy on my feet and is such a luxury to have. 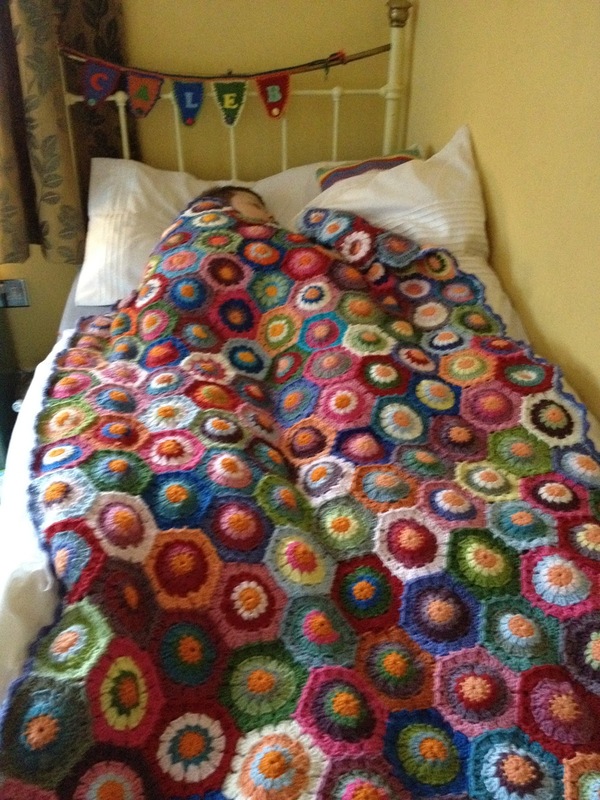 I must give credit to my friend Helen for designing this blanket, she was making one for her lovely daughter Harriet and it looked so delightful I thought that I should have a go myself and how glad am I that I did! Yet another success. I am very precious about my bed, well this particular bed anyway as it was the bed that I lay on and gave birth to my 2 youngest boys and it is the bed that we all snuggle up in at the weekend and they talk to us about there week. 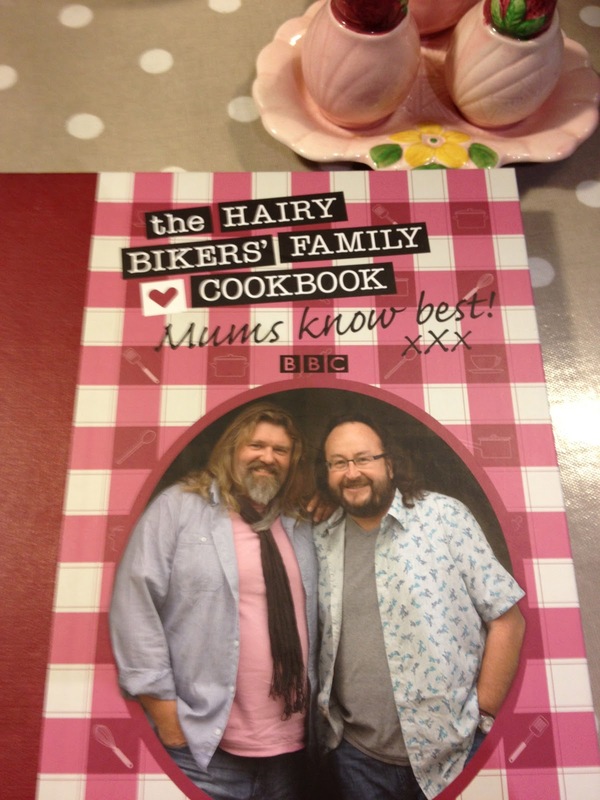 I think the title of this book says it all!! Well enough of blogging for one day, I will have a quick tidy up, sort the washing and commence battle with my new project a rainbow like stripy granny blanket for my middle sons bed! 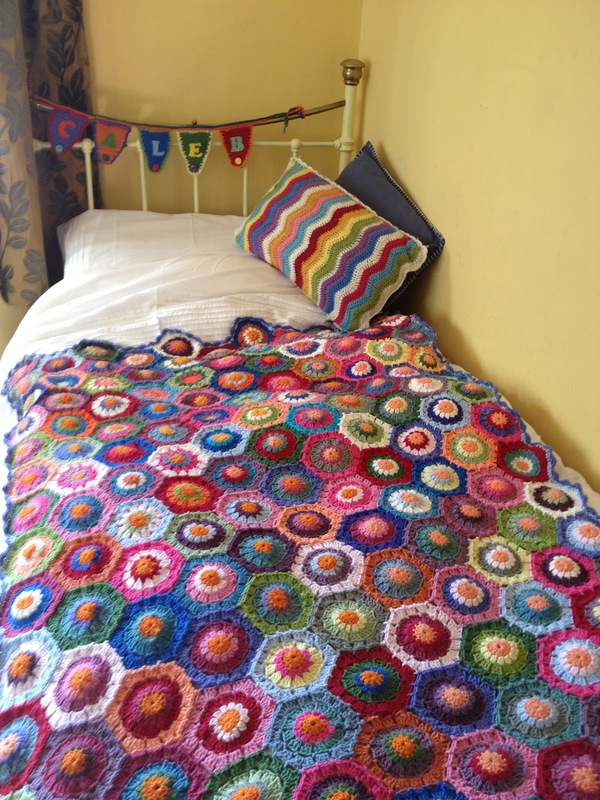 Gorgeous blanket & love all your crochet goodies! You've inspired me to make crochet name bunting for my daughter's birthday!